The fortress is on fire. Towering, horned ogres swing their massive clubs, sending several armoured soldiers and orcs flying. Giant beasts wearing ballistas climb crumbling buildings to rain fiery projectiles down below. Wyverns soar in the sky above, spewing hellfire in all directions. In the middle of all this chaos is you, Talion, a human ranger on a relentless quest for revenge. 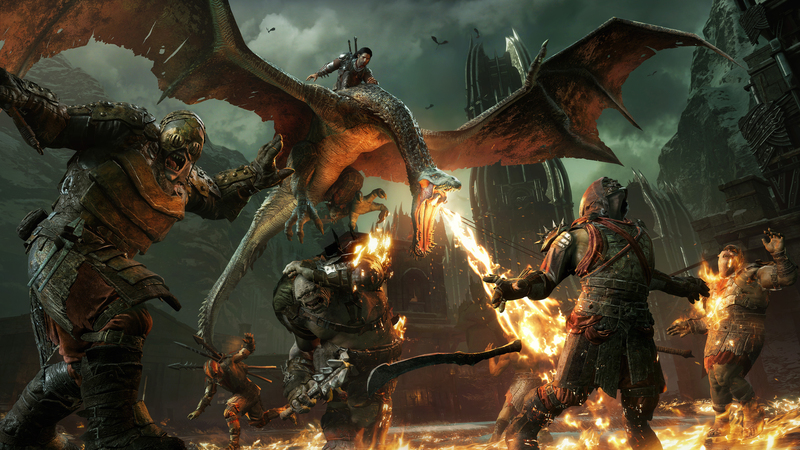 Middle-earth: Shadow of War is the follow-up to what was perhaps the biggest surprise hit of 2014, Middle-earth: Shadow of Mordor. In a story set between the events of The Hobbit and The Lord of the Rings, you play Talion, whose family was killed by the forces of series antagonist Sauron. Talion, too, was about to meet his end but was saved by Celebrimbor, an elven wraith from The Silmarillion that was manipulated by Sauron into forging the Ring of Power. 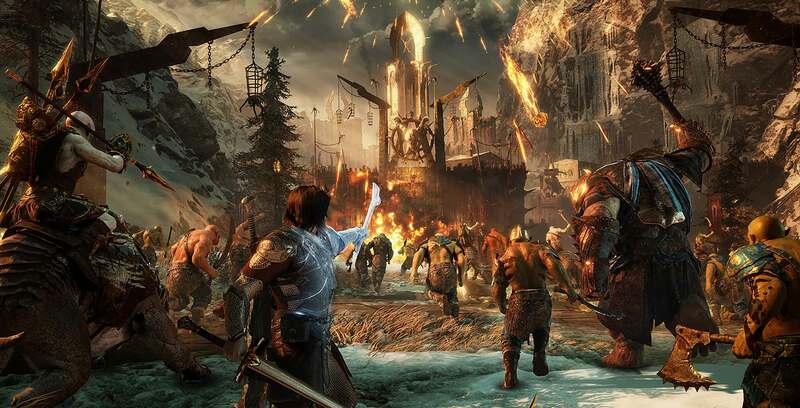 Bonded with the spirit, Talion gains all kinds of magical abilities, and together, they set off to have their revenge against Sauron. To do so, they’ll need to retrieve the Ring of Power and amass an army that is strong enough to take on the dark lord. I’ve only put about a dozen hours into the game so far, so I can’t fully comment on how the story unfolds. However, I will say that it was a rather bizarre and questionable decision to turn Shelob — the giant spider that attacks Frodo and his friends in The Two Towers novel (and Return of the King film) — into a seductive witch who takes the Ring from you in the game’s opening minutes. She, as well as many of the other supporting characters, don’t seem to get a great deal of characterization. However, the story is just an excuse to slay some orcs, and Shadow of War gives you this in spades. The game’s combat involves the same incredibly satisfying Batman: Arkham series-style fighting from the first game, featuring combo chains, properly-timed counters and vaulting over enemies. You can also use a small dagger for stealth and a magical bow for long-ranged attacks. Dismembering orcs really doesn’t get old. However, enemy AI can be incredibly stupid; while orcs aren’t known for being bright, you’d think they’d at least hear a fully-grown male carrying armour and a sword sprinting towards them. I was often able to run right up to an orc to perform a stealth kill without him ever even turning around. Strangely, one of the unlockable abilities says it makes Talion quieter when he sprints, which seems pointless given how faint a noise Talion already makes. 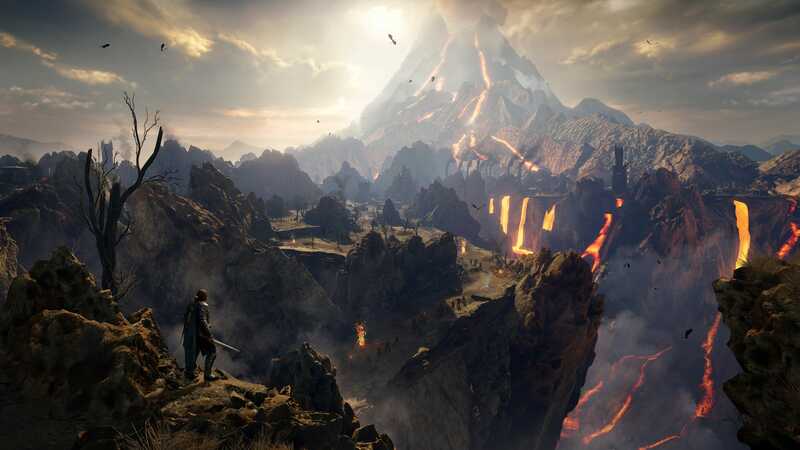 It makes stealthy approaches rather easy, and I can only imagine the difficulty lessens even further once you unlock later tier abilities that allow for Talion and Celebrimbor to momentarily detach to silently dispatch multiple enemies simultaneously. Shadow of Mordor‘s most defining feature was the innovative Nemesis System, which has enemy forces with different personality traits and attributes reacting differently depending on your war tactics. With the Nemesis System, the hierarchy of orcs — broken down to grunts, captains, warchiefs, etc — will be shaken up depending on your actions, especially your demise. Indeed, Talion’s ability to resurrect — being tethered to an undead spirit, and all that — means he can, in theory, be killed by the same foes over and over again. 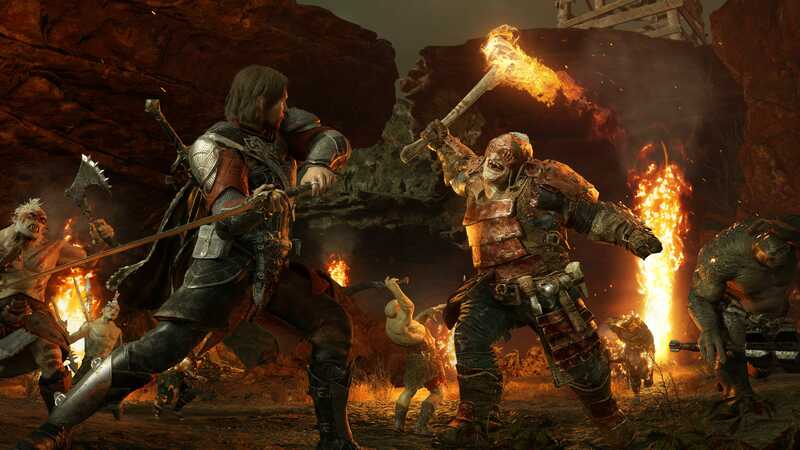 For example, if lowly orc “Tugog Man-Breaker” kills Talion in battle, he’ll gain respect in his army and move up in ranks, getting stronger abilities and possibly even a promotion. The next time you face him, Tugog, revelling in his victory, will laugh and mock you over your previous failed attempt to beat him. It’s a great way to add more character to what would otherwise be nameless fodder, as well as make encounters feel more personalized. Shadow of War takes this system and dials it to 11. During my time with the game, I had an early encounter with Tûhorn Lucky Shot, a particularly nasty crossbow-wielding orc Captain. The first time I fought him, his troops swarmed my character, giving him a chance to kill me with some well-placed crossbow bolts to the chest. The Nemesis System looks and plays out like a larger, 3D chess board. When a conflict is resolved, the armies in the Nemesis System advance one step. Depending on the outcome, this could mean they’ll kill one another, move up the chain or flee the region entirely. Because Tûhorn successfully defeated me, he received a promotion, becoming more powerful and gaining more prominence in his army. The trade-off now is that when I go on my revenge mission, Tûhorn will drop rarer loot when defeated. The Nemesis System is much more dynamic this time around. 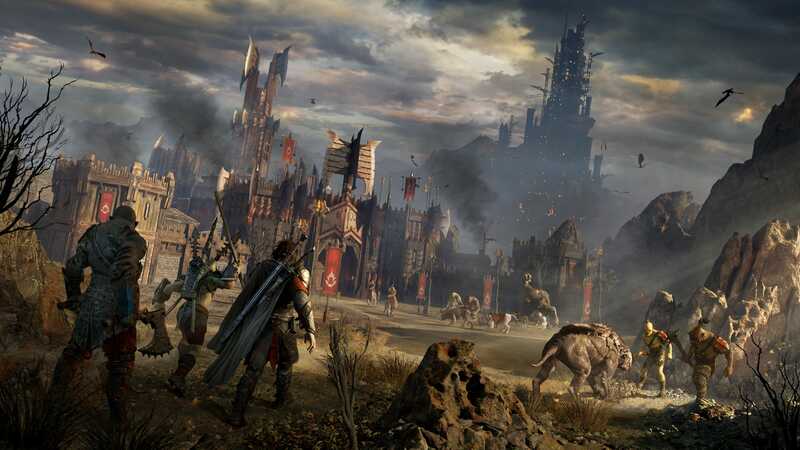 In Shadow of Mordor, orcs that defeated Talion would typically be found again roaming in the same area. Getting even with your foes meant having to return to the previous location to fight them, with little having changed since, outside of a stronger Nemesis. 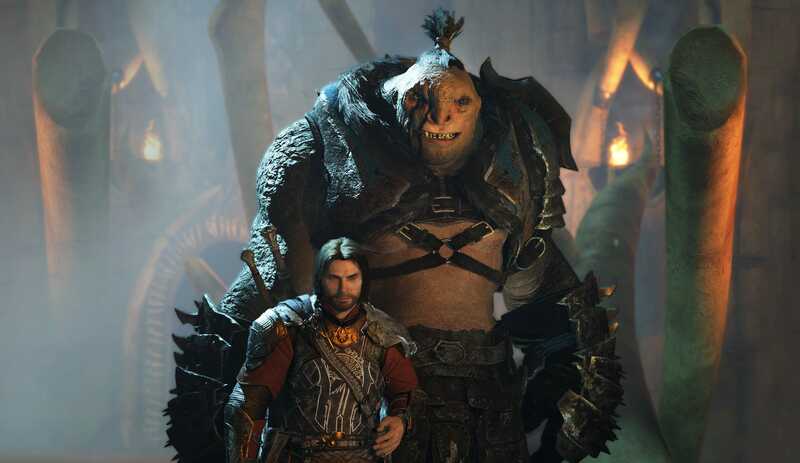 In Shadow of War, however, with locations far larger, more diverse and tied to specific regions, your Nemeses will wander between many different places. The next time I hunted Tûhorn, he’d clearly taken a liking to caragors — rabid, horned four-legged beasts that roam the lands of Mordor. Perhaps he felt he needed a bigger challenge. Given that information, I next found him on the outskirts of the kingdom, tracking down an herd of the foul beasts. As I crouched in a tower above, a small cutscene showed Tûhorn on the hunt for the creatures, revelling in the attempt to tame them. At my current low level, the caragor are particularly dangerous, and I hadn’t yet unlocked the ability to commandeer them myself. At the same time, a small group of Gondorian soldiers rushed in to take the opportunity to try to eliminate Tûhorn. Diving below, I landed a quick stab on him, though he shrugged me off and laughed, snidely questioning why I returned for more punishment. I suddenly realized that I should have done more research into Tûhorn’s strengths and weaknesses; the wretched orc carried an ability that prevented caragors from ever attacking him. Therefore, after making quick work of the soldiers, the caragors all turned and quickly tore me to shreds, Tûhorn cackling all the while. Next time, I didn’t make the same mistake. I made sure to challenge him when no caragors were present. I also surveyed the area and noticed a barrel that I could use my elven bow to detonate when Tûhorn’s camp did its rounds. With all of his forces set aflame, the nearby friendly soldiers quickly joined the battle to finish them off. Meanwhile, I took advantage of the ensuing chaos and I raced towards the burning, stunned Tûhorn and drove my blade cleanly through his head — hugely satisfying given the four times he’d beaten and mocked me before. The beauty of the Nemesis System is that this whole experience with Tûhorn is unique to me. 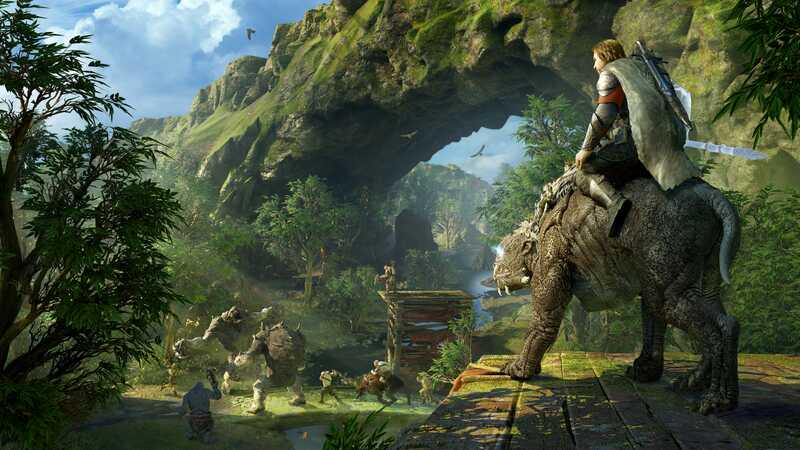 None of that was scripted, instead unfolding naturally through the convergence of several dynamic gameplay systems and the open-world setting. Most impressively, this all came out from just one Nemesis that I encountered — there are plenty more developments with others that would vary greatly depending on who is playing. And these are only the kinds of smaller, intimate conflicts — there’s a larger titular war at play, too. As in the first game, you’ll also unlock the ability to dominate the minds of orcs to bend them to your will. Once manipulated, orcs can be sent to deliver death threats to other Nemesis, infiltrate the ranks of other factions, sent off to run their own forces and more. New to Shadow of War is the Nemesis Fortresses, which are massive enemy strongholds that you can conquer for rewards. Using the infantry you recruit in your travels through the Nemesis System, you’ll be able to plan your assault on a Fortress. As mentioned earlier, the sheer scale of these encounters is jaw-dropping, with hundreds soldiers, orcs, trolls, dragons and even spiders and ghouls able to join the battle all at once. A player who effectively uses the Nemesis System will have a swath of armed and loyal forces to do battle for them, making your conquest delightfully ruthless. 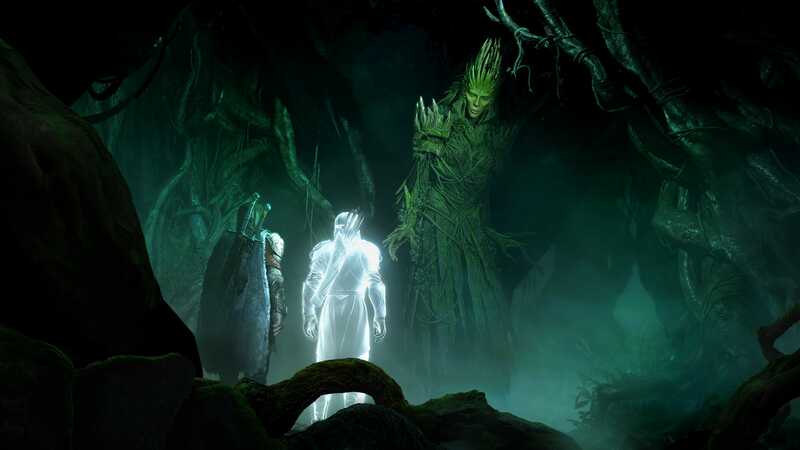 Middle-earth: Shadow of War smartly doubles down on what made the first game so great. Refined combat, a larger, more lively world and deeper progression systems make the experience richer and more complex. Similarly, the completely expanded Nemesis System fully delivers on the groundwork laid out in the first game. So far, the story leaves much to be desired, as does the enemy AI, but taken as a whole, Shadow of War is shaping up to be a stellar action-adventure experience and one of the best games of 2017. Middle-earth: Shadow of War is now available on PS4, Xbox One and PC at a suggested retail price of $79.99 CAD. For more on Middle-earth: Shadow of War, check out my thoughts on the mobile version of the game here.